We have organized a special educational tourism courses at our well defined institute which is specially designed to give short term Training to various IT professionals who are based anywhere in the world. This educational tourism service includes short term IT certification course. These quality courses can be availed by our national and international clients at much lower price as compared to the courses they receive at their native place. The course is available in three tracks which are regular track, fast track and super fast track. To place the professionals in the tracks as per their merit, we conduct different knowledge level tests which further help us to decide for which track the client is suitable. 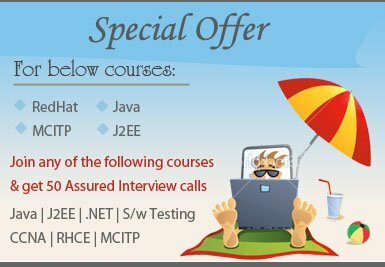 The first track is for the fresher who do not have any experience and knowledge in the IT field. Second track is fast track it is for those who have some knowledge and experience in the IT field and need Training to improve their skills. The third track is super fast track, it is for those professionals who have prior experience and knowledge but do not have the certificate and also lack the time for starting the full course from beginning.